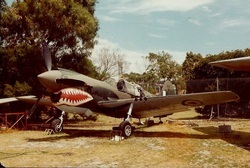 In all around 838 examples of the Kittyhawk served with the RAAF in the South West Pacific area, making it one of the most numerous single types contributing to the defence of Australia in World War 2. Our aircraft, serialled A29-53, was one of 163 “E” models to see service with the RAAF. It served with No.76 and 77 Squadrons and served in Perth, Darwin and the North West of Western Australia. Criticised for lack of high altitude performance, the Kittyhawk was not a direct match for the Zero, but tactics were evolved that exploited the strength of the aircraft and it’s ability to absorb tremendous combat damage, something the lightly built Japanese Zero could not. Rushed into service at the outbreak of the Pacific War, the first 25 aircraft were thrown against the Japanese in the defence of Port Moresby by No.75 Squadron. The Kittyhawk also served with No.3 and 450 Squadrons in the Middle East. In all, Kittyhawks equipped 3,75,76,77,78,80,82,84,86, 120 (NEI) and 450 Squadrons of the RAAF as well as second line units. For many years the P40 at the Museum sat on top of a pair of P-51 Wings and was nicknamed the Kittystang. At the moment the Museum's P-40 is undergoing an extensive restoration with United Aerostructures and is off display. Keep checking the Restoration page for updates.